Having a blog is a great way to organize your thoughts! I'm going to keep updating this post as I figure this key element out. Baby Girl has a dairy allergy, and I suspect an egg allergy, which makes the whole cake thing a bit challenging. There is a really popular Wacky Cake out there, but it uses cocoa powder, which I'm not too keen on. One, I don't like chocolate cake, and two, last time she had any caffeine (I had an Earl Grey soy latte at 7pm while nursing), she was wired until 3am. Now, she was three weeks old at the time, but it's not an experience I want to repeat! So no cocoa powder, and I don't know how integral to the recipe it is. Cake trial number one: Pinterest lead me to a Vanilla Sponge Cake that can be made gluten, dairy, egg, nut, and pretty much all allergen free. I'm going to make this for desert when we have Ryan's expectant godsister and her hubby over to check out some of my baby carriers (I may have a bit of a carrier problem...). Hopefully this works and we'll be all set. If not, I have a box of my favourite "looks like you spent hours instead of less time than it takes the oven to heat up" desert on hand. Cake colouring: Another Pinterest find (what part of this party didn't get it's source from Pinterest? Oh, right, the movie! ), I want to make it a rainbow cake, without any food colouring. Frosting: I am not a cake decorator. Any time I've tried to ice something in the past it has gone horribly wrong. And yet, I still wanted to give it a shot. I found a buttercream recipe I could adapt to be dairy free (what? buttercream doesn't actually have butterjQuery15206313854226691823_1400019203538? I had no clue!). And as lovely as the Hydrangea frosting is, I didn't think I'd be able to pull it off, so I went with the much more popular (and simple, and supposedly super quick) rose design. I also love her video tutorial. I need to make a trip to Michaels to pick up some piping bags and an "M1" tip and I'll give it a try! Wish me luck (I'm going to need it!). Cake One Results: It was a bit oily, insanely sweet, and a little dense, but I think I can work with this recipe. The icing was really oily, so I'm going to experiment with mixing shortening and Earth Balance spread. Cake trial number two: My girlfriend wanted to see how I did the roses, so I whipped up a second cake over the weekend. This time I used club soda instead of water, apple sauce in place of the oil, and reduced the sugar by a quarter cup. The cake ended up quite dense and not sweet enough. The icing wasn't as thick as it should have been, so I need to play with the ratios a bit more. 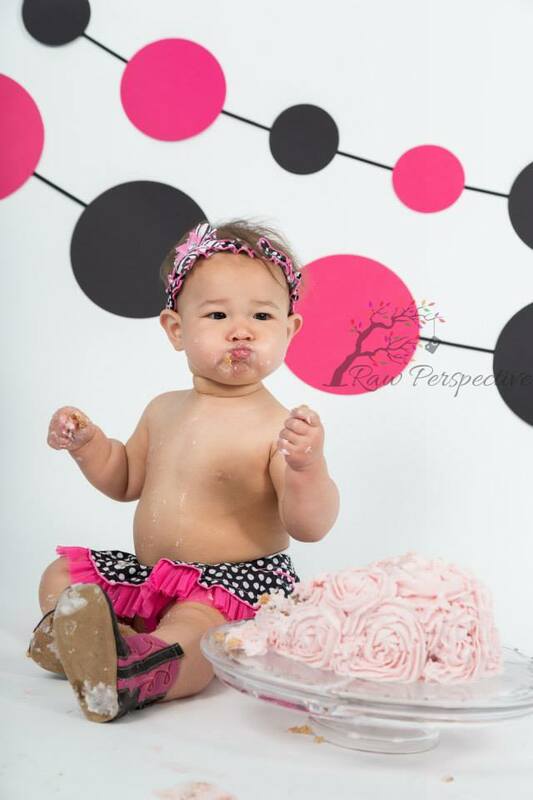 Cake trial number three: I made this cake for Baby Girl's one year photo shoot/cake smash. I went back to water, split the oil/apple sauce 50/50, and increased the sugar slightly. I was pretty happy with the cake, but still found it dense. The joys of not being able to cook with egg! I tried colouring the icing using blended strawberries and it was a complete disaster. I had to start over from scratch with zero time left. The final cake: I made both a sheet cake (double batch) and a "smash" cake for Baby Girl. During the week between cake three and her party we discovered that eggs were okay, so I decided to ditch the oil/apple sauce struggle and just use egg, which really helped the fluff factor (though it is still a pound cake!). Icing wasn't great again. I didn't tint the cake, so I coloured the cake with some liquid dye I had (after the disaster with cake three I wasn't fussing with alternative colouring sources). I made the icing slightly too runny this time. I iced the cake on Saturday night and by the party on Sunday the roses on the side of the smash cake had slumped a little. Final opinion: I am not a cake person! I'll probably switch to pies or other deserts after this. No one cares about a two year old doing a cake smash, thankfully. The cake, however, was a huge hit.